Constraints of Gage R&R (Repeatability and Reproducibility). R&R is the combined estimate of repeatability and reproducibility where repeatability is variation in measurements obtained with one measuring instrument when used several times by an appraiser and reproducibility is variation in average of the measurements made by different appraisers using the same gage. Essentially, there is no estimation of gage accuracy and repeatability in Gage R&R. Also, in the combined estimate of repeatability and reproducibility the effect of reproducibility can mask the effect of repeatability. One major challenge confronting conventional R&R is limited design space with a restriction of a number of appraisers, gages, methods, and inspection schemes. 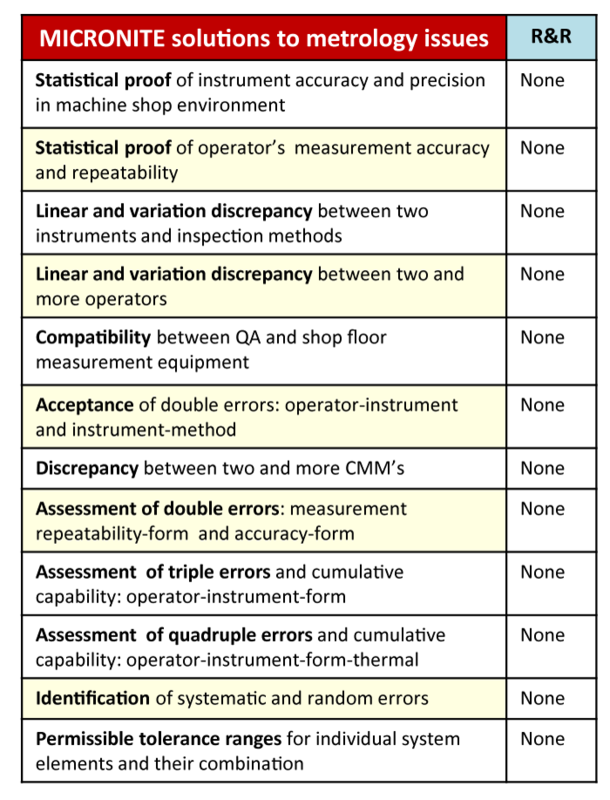 In the standard R&R format a fixed number of operators (three) and sample size result in very large standard errors for the estimated variance components, therefore, it leads to large errors in the estimate for reproducibility. For more information order e-book “Metrology Innovations with the power of MICRONITE analytics” from Dr. Birman’s library.